June was a busy month for Mosaic with so many Seniors’ Months events! Jane, Dina and Martha were out and about spreading the word about all of the wonderful programs that we host, as well as providing information about other agencies and their programs. Jane and Martha attended the Blossom Party at the Toronto Botanical Garden (https://torontobotanicalgarden.ca/) and sported their finest dresses and party hats. The Deer Park Library and the Thornhill Village Library also hosted tea parties which Jane attended and had Mosaic information tables. 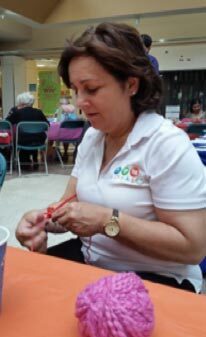 Our annual Seniors Month Celebration provided music and lunch to almost 70 guests, and the following day we participated in the World Wide Knit in Public Day! We had a great group of people attend this and we have started on our next project of knitting twiddlemuffs for those living with dementia. In September we will be offering another knitting group day at our Markham Resource Centre and a new group starting at our Toronto Resource Centre at the Canadian National Institute for the Blind. Review our next newsletter coming out in the fall for these updates. Now that June is over, and we are able to recover from all of the community events, we will be focusing on preparing the Fall Newsletter and Community Resource Centre programs. For this, WE NEED YOUR INPUT! Please send us an email with topics you would like us to cover. In addition to this, we are working on our Community Mapping Project. One of the areas we are looking at is where informal meetings of seniors take place (think of those who meet at coffee shops, in Churches or Libraries where there is no ‘scheduled or posted’ information, but that we could promote to others). Please let us know if you know of any places where seniors gather so we can include this in our mapping project. Emails can be sent to dina@mosaichomecare.com. There is so much to do in Toronto over the summer. Below is a sampling of events that are cheap and cheerful for the whole family! 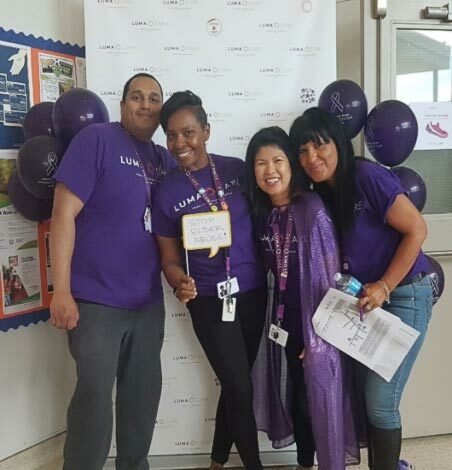 Our Mosaic's Pole Walking Groups! Throughout the summer, Mosaic hosts Pole Walking at both of our Community Resource Centres. POLES ARE NOT NECESSARY!!! This is an opportunity to come and join a fun bunch of people who are looking to enjoy the outdoors with others. Varying levels of fitness are fine, as we have some fast and slow walkers. We go at our own pace. Following the walk, we come back to the Community Resource Centre for beverages and conversation. RSVP by calling 905.597.7000. Do you knit or crochet? All levels are welcome to this weekly program where we get together to enjoy each other’s company. At the moment, this is only offered at the Steeles Community Resource Centre, but if you are interested in the Toronto location, please let us know! More details will follow in the next quarterly Mosaic’s Fall Newsletter. 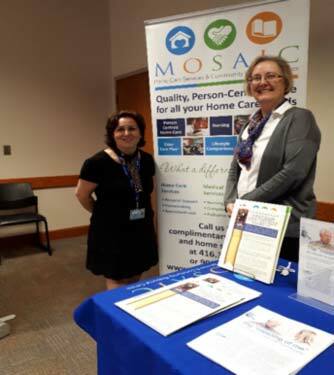 Come visit us at our Community Resource Centre and meet our wonderful staff and Mosaic nurses! If you have been before, bring in your blood pressure booklet for us to update. If this will be your first time, we will provide you with a booklet so that you can keep a record of your results. Moshe Schwartz from Gentle Motion will teach us how to reset our bodies and get strength back in this interactive and informative presentation. 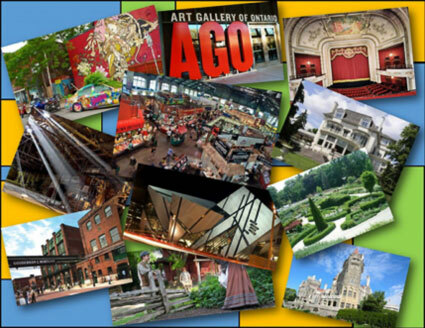 Here are just a few gardens to visit that offer a variety of paths, tours, and sights. Open daily, Farmer’s Market Thursdays from 2-7pm, Music Concerts Thursdays at 7pm and of course lovely gardens that you can take a guided tour or go on your own. A special camp day just for seniors! At only $8.00 for the day, it is money well spent. For an extra $7.00, you can enjoy the lunch they provide. A short ferry ride and you are greeted by staff and can take a golf cart around the island. What a wonderful way to see the Toronto City skyline. This is an especially nice day for those who never went to camp. Every Wednesday, something special happens at St. James Park. Like Dancing? Then St. James Park – Swing Night is the place to go! On Thursday July 19th, there will be a free dance lesson at 6:30pm, followed by music and dancing in the park. All ages welcome! Yoga, movie nights and more are offered. Even historical re-enactments for those that enjoy history.